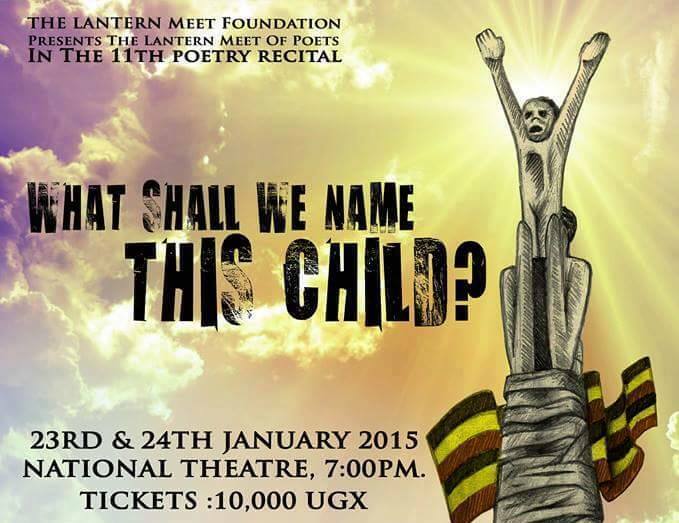 What Shall We Name This Child, a recital by The Lantern Meet Of Poets started showing yesterday and is on today as well. Bwesigye bwa Mwesigire, a friend of Sooo Many Stories has been talking to the Lantern Meet of Poets members about poetry, the recital among other things. Below, he talks to Guy Mambo, one of the co-founders of the poetry outfit. BM: As one of the founders of the meet, take us through the first days. Why did you start? How did you start? Who were you with? GM: Hahahaha, you are asking me to write “the book”. I’ll answer but in part: it was started with the vision of restoring Africa to its literary prime, to fill the gap left by the first great writers of the post-colonial era. Poetry is the highest form of writing and hence our vehicle of choice. The Meet, in its current formal character was instituted amongst myself, Ojakol Omerio, Sophie Alal, and Colin Asiimwe. The rest belongs in “the book”. BM: Are you happy with how the meet has grown? Are there things you think you could have handled differently? Are there things that you did not hope for, but happened? GM: I have been confronted with this question before. The Meet is growing (and growing strong) and it will always grow into what it must grow into for its time. The ethos of the organisation hasn’t been tampered with, I therefore trust that it is where it was meant to be. I am happy with it, I certainly am. BM: What is the level of your involvement with the meet today? GM: My involvement recently is advisory, and I like it. I continue to attend Sunday meets too, I find them relaxing. Plus The Meet constitutes a good chunk of my closest pals. BM: When do we see a collection of poetry authored by yourself? What do you see as the connection between performance poetry and written poetry? GM: I don’t know when I will publish my own collection. In a few years I suppose. I have no cause to rush, the verses won’t run away. Some poems are suited for the ear while others require you to carefully read and re-read. My opinion though is that in either case it must not be prosaic. It must evoke. BM: How did the idea of the recitals begin? GM: Recitals were conceived as an opportunity to share the work we were doing with the general public. Like many things else at The Meet, recitals developed in an organic manner, it’s primordial nature being our vision to “infect” society with our revolution. I believe it’s still morphing. BM: About the What Shall We name This Child recital, why should someone attend? What special thing have you prepared for us this time? GM: Hehehehe, why attend? Attend because the arts are a mirror to society. If for no other reason, come like you were fulfilling an overdue appointment with your dentist. There might be complements about your well grown wisdom teeth, as well as announcements of cavities and recommendations of root canal. Come and be with art.